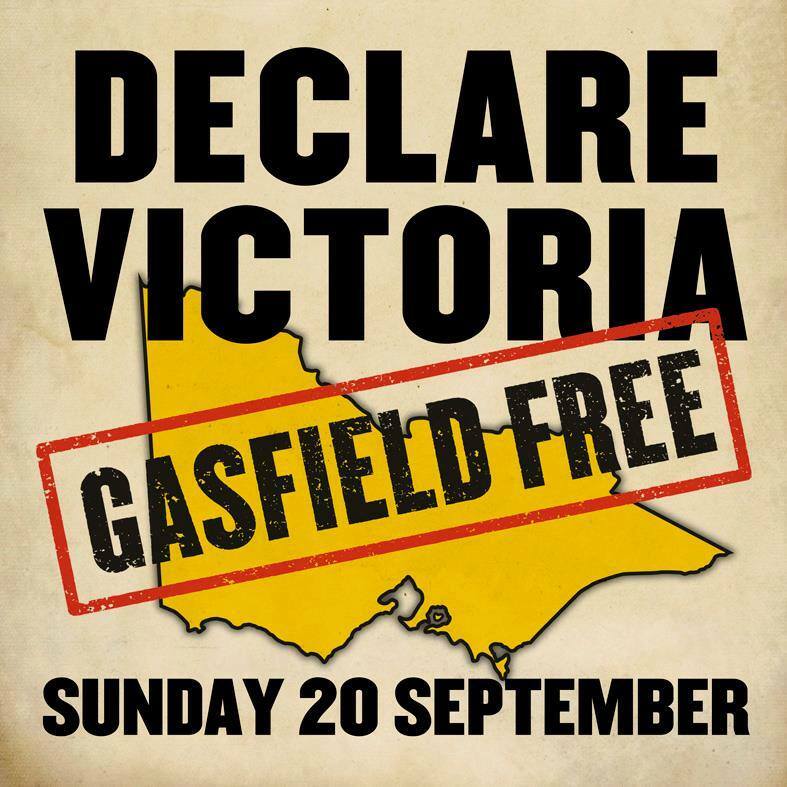 As the state government is reviewing the unconventional gas industry's future in Victoria, we hope you'll join us at a protest calling for a permanent ban on shale, tight, coal-seam gas, and fracking and underground coal gasification. Victoria doesn't yet have an unconventional gas industry and we think it should stay that way. How bad could it be? At Chinchilla, in Queensland's Darling Downs, Linc Energy's trial underground coal gasification plant has been closed and the company is subject to criminal prosecution. A 314 square kilometre excavation exclusion zone has been declared, where farmers are not allowed to dig deeper than 2m for fear of setting off gas explosions, such is the pollution of the ground with flammable gases. A version of this same technology was proposed for the region just south of Bacchus Marsh (near Balliang) by company Regal Resources. Underground coal gasification takes unburned, flammable gases from a coal seam that is burned under high pressure underground. Once things go wrong underground – like if the pressure is too high – it's hard to fix, as the farmers around Chinchilla have discovered. Unconventional gas isn't just a new, extreme form of resource extraction. It's also unnecessary. Melbourne University researchers have shown gas demand could fall by half within a decade. The future is in renewable energy, not pushing into extreme fossil fuel extraction methods. We hope you will join MEG's contingent at the September 20 rally. We'll be training in, so get on board and look out for us with our banner! 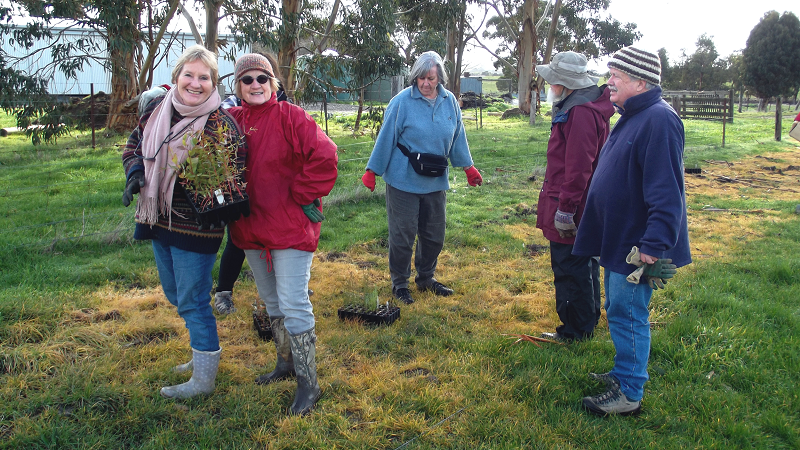 Moorabool Catchment Landcare Group are to be congratulated for winning the Media Fairfax Landcare Community Group Award. 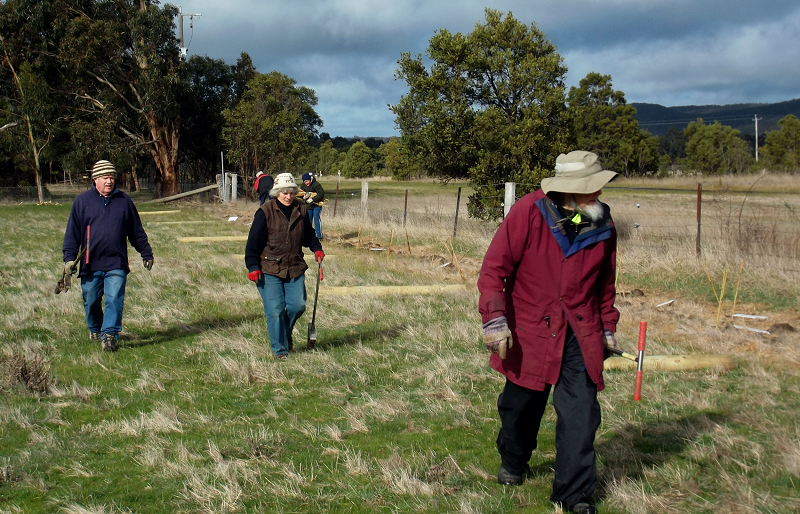 We're happy to report MEG members teamed up with these champions in late July to plant 200 native trees and other plants on a property near Mt Egerton. Thanks in particular to MEG's Rose De la Cruz and Elle Fox from MCLG for organising the day, and Adrian McGlinchey who took these photographs. And of course to all the volunteers who helped! Free food in Bacchus Marsh! 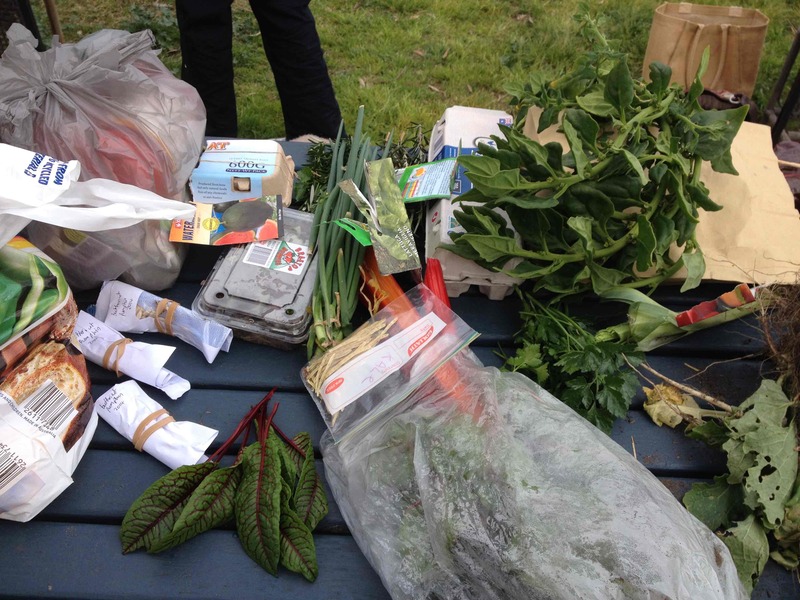 The Bacchus Marsh Produce Swap continues to attract new faces, as the word slowly spreads through the community. The Produce Swap is held on the first Saturday of the month from 1-2pm on Holts Lane next to the Baptist Church at the Darley Community Art Graden (DCAG). People can swap all kinds of home grown and home made products. This can vary from fruit and vegetables, seeds, seedlings, soap, chook and duck eggs, wormfarm "wee", preserves, pot plants, egg cartons and much more! How does it work? Swappers bring along their produce on the day, and place it on the table. While waiting for others to arrive with their produce, people can network, talk about their produce and how it was grown and share tips and information. Towards 2pm, people may take what they need, roughly to the equivalent of what they brought. Some people come with lots, some come with a few herbs or seeds to share, there is no minimum! 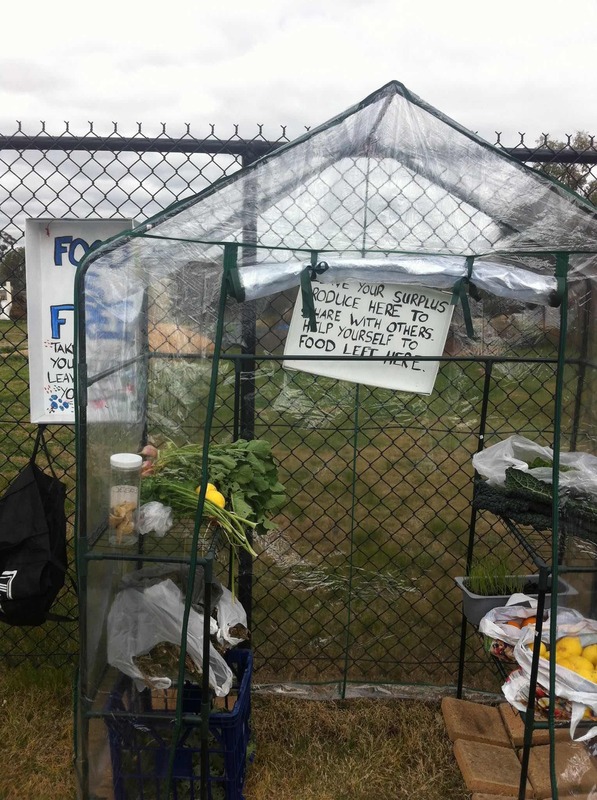 The Produce Swap works closely with the Darley Community Art Garden (DCAG). If you have not been, drop in! It's a growing community and now boasts a fantastic wood-fired pizza oven. 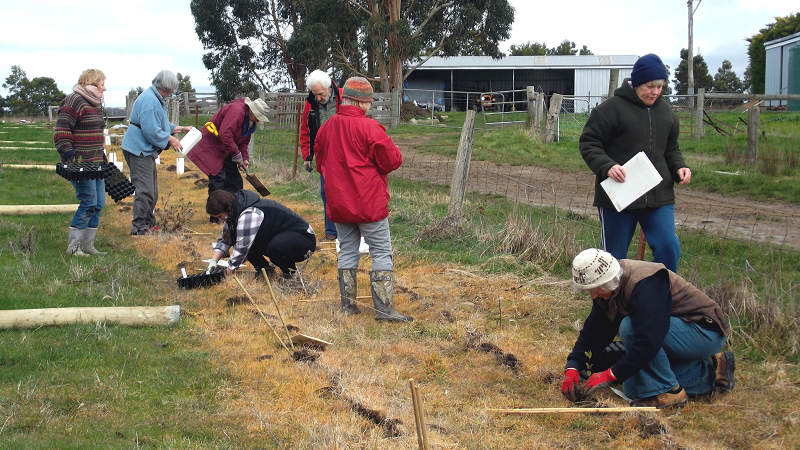 DCAG have been holding some fantastic workshops, including one on Fruit Tree pruning run by Jeff Jones and a "Fertile Soil Fundamentals" no dig garden workshop in collaboration with Western Water. The next workshop coming up is a Bread Making workshop on Saturday September 19th at the Darley Community Art Garden 2-4 pm, $5 per person, RSVP to darleycag@gmail.com. The Produce Swap and DCAG have recently started a FOOD IS FREE stall just outside the DCAG on Holts Lane. This is a fantastic, world wide movement that has taken off in Ballarat, and now in Bacchus Marsh. The basic idea is that you can leave your excess home grown produce at the stall for others to use, and take produce from the stall - all free. MEG has made a submission to council regarding the proposed rezoning of land at the corner of Clifton Drive and Gisborne Road for a Bunnings store and other shops. The proposal has raised significant opposition from locals. MEG have not taken a particular position for or against Bunnings, but think a substantial new traffic generator in one of the most congested areas of town would be a bad idea. In particular, the submission notes, MEG is concerned at the lack of facility for active and sustainable transport options (walking, cycling, bus) in town. We think council needs to make steps to fix these gaps in particular, before putting a new, large traffic generator in the middle of one the worst traffic-affected areas. As the town population is growing, these transport problems are getting worse. Measures for active/sustainable transport may or may not reduce road traffic, but give a healthy alternative for those wishing to avoid the traffic jams, reduce their personal pollution, or get fit. You can read our full (brief) submission at our website. We should also note that the new petrol station proposed for Bennett St (and mentioned in our last newsletter) was rejected by council. Is 2 degrees what we bargained for? In December the next round of international climate talks kick off in Paris. While international negotiations have been coming to the conclusion that it will be difficult to limit the planet's warming to 2 degrees as they have been aiming for, scientists have on the other hand been saying that lower targets of 1.5 degrees or less should be adopted if we wish to avoid catastrophic effects. We know that even now, with more than 0.8 degrees of warming above pre-industrial levels, the earth is heading into unfamiliar and inhospitable territory: bushfires in alaska, winter bushfires in NSW, super-cyclones hitting southeast Asia, record drought in California: the fingerprint of climate change is already becoming evident. Victorian writer David Spratt has published a report explaining the problems with the 2° target which we have a couple of copies of. You can download it from his website. We have no carbon budget left, he says, and need to reduce our emissions to zero as fast as possible. However you personally evaluate this dire information, environment groups are organising a People's Climate March against international (and particularly Australian) government inaction on climate change, to coincide with the beginning of the Paris COP21 talks. The protest will be a big moment in Australian politics, and we hope that as many as possible will organise to go into Melbourne that Friday night to join the crowd and have your own voice heard on the international stage. Melbourne will be one of the first big protests in a worldwide weekend of actions (due to the date line) so we can help set the agenda. So set it in your diary: People's Climate March, Melbourne, Friday 27 November, 5:30PM at the State Library. 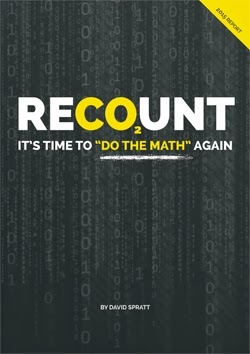 Join with tens of thousands of others. All supporters welcome. Phone Ben on 0413 580 706 for more info. Copyright © 2015 Moorabool Environment Group, All rights reserved.